This is the first of a series of posts about how I'm taking forward objective two of the single domain project: the "private beta test of a shared 'corporate' publishing platform aimed at replacing most of the activity currently hosted on numerous departmental publishing environments". So what does one of those look like? Fondly known in the project team office as the multi-storey car park, this diagram (based on an original by product lead Richard Pope) aims to show what we are building and how the pieces fit together. 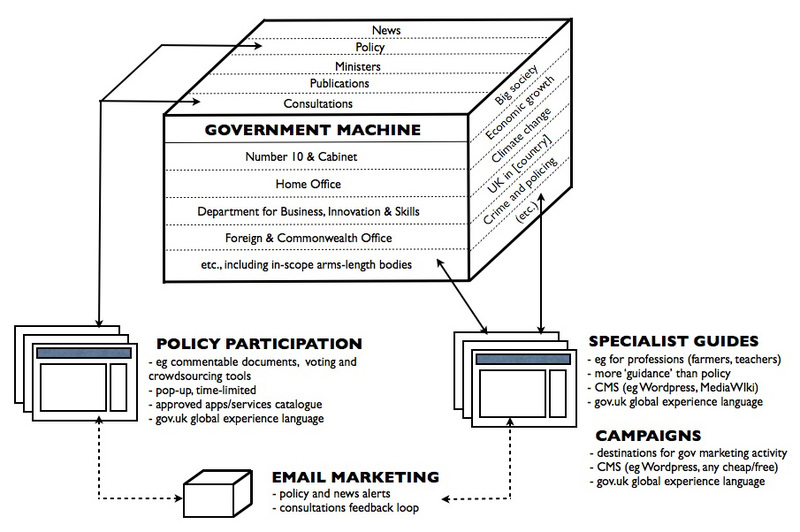 This is the platform's irreducible core: a bespoke box of tricks we'll be building from the ground up to meet the publishing needs most government organisations have in common, and the information needs 'specialist' audiences most commonly have of government. (For 'specialist audiences' read: people who are professionally or personally interested in the work or workings of government). You can usefully think of it as the publishing engine for government organisations to be transparent and accountable about what they are doing, through structured content and open data. There's a distinction worth making between the "who we are and what we do" stuff described above, and clusters of information government publishes for practitioner audiences - such as a guidance for the schools workforce from DFE, or reference material for courts and legal practitioners from MOJ. This guidance content feels more tailored, self-contained and closer to traditional web publishing than the structured and tightly interwoven approach we'll be taking for the core platform. Right now, we think it probably lends itself to spin-off sites within the gov.uk domain, using flexible and familiar tools like WordPress, governed by a set of rules (the global experience language, or GEL) so they look, talk and behave like part of the core. There's work to be done to discover how many of these there could be and define the rules to contain sprawl and minimise overlap. But the principle is sound and has been testing well in my conversations around Whitehall. Government has a need, often a duty, to tell people about things - to raise their awareness or change their behaviour - and is doing it in ever more strategic and cost-effective (i.e. digital-first) ways. 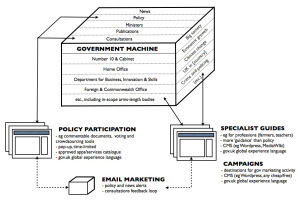 While much of the online delivery of campaigns rightly takes place elsewhere on the web, for example through Facebook ads or media partnerships, most campaigns also need destinations within the government domain to provide authoritative detail and, through analytics, measure the return on campaign effort and spend. Flexibility, both of technology and the GEL, is critical here - creative treatment really matters and no two campaigns are the same. It wouldn't make sense to template this too tightly, therefore agile and lightweight tools like WordPress again feel like a good match here (or where a PR agency is involved, any cost-effective platform of their choice). The boundaries might get fuzzy between campaigns and specialist guides. Where a campaign targets an audience for whom there’s a guidance hub already, clearly it will make sense to put the marketing messages there. In the alpha we set a vision for online consultation and policy engagement, which was broadly felt to be along the right lines. In the beta, we’re taking that vision forward. There's a blog post's worth of stuff to say on this topic alone but in brief: the third major component of the corporate platform is in fact many platforms, and probably a good few services besides. We'll be curating a catalogue of tools, support and training to set a new baseline for online consultation, and build consensus and capability in Whitehall to do it well. Experimentation in this area is key, so we'll nurture a vibrant SME marketplace, starting with existing best of breed providers and encouraging new ideas. But consistently good user experience matters here more than anywhere, so inclusion in the catalogue will be contingent not just on the GEL but on meeting standards around security of personal data, timely feedback to participants and cross-promotion of other opportunities to get involved. I’m gathering some of the best thinkers and service providers in this space very soon to flesh this out in more detail. Running right across all of the above is a need for push mechanisms, to tell people - who opt in to be told - when there’s new stuff to see. Taking RSS and other content APIs as read, government also needs to directly manage relationships with its engaged audiences and alert them about news, policy changes which affect them, the progress of consultations they responded to, and opportunities to get more involved. And that means email. Lots of email. I’ll go on record and say email marketing is government’s biggest missed trick. Plenty of it goes on, but not much of it is co-ordinated across organisational boundaries to share data and join up messaging by audience. As websites move into a single domain, it follows that the user experience of government email should enjoy a similar revolution. It remains to be decided what email functionality we will deliver in the private beta, but it's high on my list of priorities to get this right for the production system. So that’s it. You can take your 3D glasses off now. Hopefully, unlike your average 3D experience, it made some kind of sense. I plan to follow this up soon with two more posts, first on how I have gathered and analysed the user needs for government’s corporate web publishing, and second to share the work-in-progress wireframes. Neil Williams is product lead for the corporate departmental publishing platform in the single domain project, on loan to the Government Digital Service from the Department for Business, Innovation and Skills. Follow @neillyneil on Twitter and see his personal blog. Fantastic website. A lot of helpful info here. I'm sending it to several pals ans additionally sharing in delicious. My fault, could have been clearer. The principles numbered 1 and 2 in my post don't correspond to the dimensions on the diagram. Principle 1 covers two dimensions: content types and topics. Principle 3 covers the third: organisations. how will search work in this model? Good question - an oversight. It will work brilliantly and how users expect, of course!, but we're on a voyage of discovery as to the detail. "We recognise that most visitors to current department websites are professionals or subject matter experts and they require a search solution that will help them find specific documents or data. Search will also play a roll in surfacing related content and directing more general users to citizen or businesss content." Your model suggest you are just looking at content based websites. A while back we saw government websites in two dimensions - reading places and doing places - this distinguished content from transactions - existing transactional in government have this distinction and it works well in terms of customer expectations. Hi Dave. The transactional stuff (things citizens and businesses need to 'do' with government) is a major focus for the overall project - but not so relevant to my part of it. The 'do' as relates to the machinery of government is mostly informational (hold to account, find out about, complain to, understand, influence). Stay tuned for my post on the needs this above model aims to meet. Should clarify this point a bit. This might not be an original thing to say, but I feel the need to let you know this just in case you haven't already heard....this looks like a giant waste of money. Whilst you seem to be very keen to embrace the very latest technologies and web-design philosophies, you seem to be using the same mindset that 'IT people' have been using since the 80's: "We have a system that isn't working completely right and we have new technology available to us, so what shall we do? I know, lets scrap what we have been doing, forget all the lessons we've learned, and not use any of the staff who have experience in this area and design a whole new system - THAT will solve our problems." Indeed -- this seems to be the case right across local authorites right now, scrambing to throw out stuff that's old, and claiming it's outdated, but yet it works! Hope thats not the case here. This is a really useful summary of what you are doing. Do you intend the website to be UK wide ie will it be promoted by all governments as a destination for informaiton about their work? hi, great post. thanks. can i ask what's the hook up with data.gov, if at all? will that be brought into the single domain too, or will data from it be aggregated into e.g. a contextual area combining guidance, news, data etc for, say, 'I am a...' audience? Good question! No firm decisions yet on the hook up with data.gov.uk for this beta - that bridge remains to be crossed. Long term it is likely to be brought in, but again nothing confirmed as yet. @Rachel - it will cover all policy set by UK Parliament, and (in current thinking) flag for visitors from devolved administrations which content is not relevant to them, where possible with deep links to the URLS they need.